In the trial for six ex-Pennsylvania narcotics officers accused of conspiracy, robbery, extortion, kidnapping and drug dealing during a six-year racketeering scheme, opening statements began with a verbal sparring match between the lawyers. 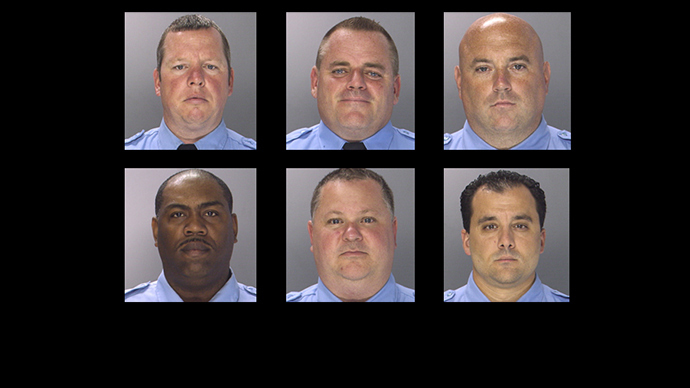 The former Philadelphia police officers were charged with committing a variety of crimes between February 2006 and November 2012, among them beatings, threatening to shoot suspects, busting into homes without warrants to steal drugs and money, and the distribution of narcotics. The officers standing trial are Thomas Liciardello, 38; Brian Reynolds, 43; Michael Spicer, 46; Perry Betts, 46; Linwood Norman, 46; and John Speiser, 44. "Make no mistake about it ‒ taking money while armed and while exercising your power as a Philadelphia police officer and keeping it for yourself and your co-conspirators is robbery, even if the money is illegal drug money," Assistant US Attorney Anthony Wzorek said during his opening statements on Monday. He told jurors the former officers routinely broke into homes without search warrants and ransacked them to steal drugs, cash, a Rolex watch and other valuables. “These are men sworn to uphold the law but instead broke it," Wzorek said, accusing the six men of "disrespecting their badge" by shaking down suspects, stealing hundreds of thousands of dollars and lying about it on their police reports. But Jack McMahon, Reynolds’ lawyer and the first defense attorney to give an opening statement, told jurors the government had little evidence to back up the testimony of their criminal witnesses, including that of convicted former narcotics unit member Jeffrey Walker. "They take all this cast of characters, and they get Jeffrey Walker, and they think... they can just wash away all the problems of this case," McMahon said. "When you're dirty and despicable and dumb and arrogant, it's easy to get you," McMahon said of Walker, who was arrested in May 2013 on charges of robbery, extortion and committing criminal acts through his position as a police officer. Walker pleaded guilty to robbery charges and faces up to 10 years in jail. Spicer’s defense lawyer, Jimmy Binns, called Walker "an admitted home invader," "a drug dealer," "a thief," "a drunk" and "a drooler." McMahon lambasted the government’s 19 primary witnesses, calling them "trashy," "disreputable," "greedy," "sociopathic" and "odoriferous," among other descriptions. "If you have 19 bags of trash," he told jurors, "you don't have better trash. You just have a pile of trash." The case began when the FBI started to investigate Philadelphia’s Narcotics Field Unit and conducted two undercover sting operations, the Philadelphia Inquirer reported. Walker was nabbed during the second sting, and began to cooperate with the federal investigators, telling them of cases where he and the other officers stole money or drugs, physically abused suspects or committed other crimes. In one instance, the officers allegedly held a drug suspect over a balcony railing of an 18th-floor apartment during an interrogation. In another case, the six officers kidnapped a drug suspect and held him in a hotel room for days while making threats to his family, federal prosecutors said, adding that the officers often attempted to cover their activities by falsifying police reports. Information provided to investigators by Walker was used to build the case against the rogue officers, Police Commissioner Charles Ramsey said when the six men were arrested. The six officers were subsequently removed from the narcotics unit after the District Attorney’s Office told the commissioner’s office that their testimony could no longer be used in their cases, Ramsey said. The officers were not fired at the time in an effort to maintain the integrity of the ongoing investigation, he added. "That many of the victims were drug dealers, not Boy Scouts, is irrelevant," Edward Hanko, head of the FBI's Philadelphia office, said when the officers were arrested. "This corrupt group chose to make their own rules. Now they will have to answer for it." Judge Sheila Woods-Skipper has dismissed 160 cases relating to investigations conducted by Walker. She upheld another 58 cases in which Walker played a lesser role or there was other corroborating evidence, authorities said. The six men are also the subjects of at least 81 federal lawsuits filed between November 2011 and August 2014, the Philadelphia Inquirer reported. The city paid at least $777,500 between 1999 and 2012 to settle 15 lawsuits involving Betts, Reynolds, Spicer, Liciardello and Speiser, according to a 2012 Daily News report. Attorney Michael C. Schwartz, who is representing 14 plaintiffs, told the paper that he expects the number of lawsuits to grow. The city could owe millions of dollars to plaintiffs if it loses or settles those cases. The defense’s opening statements continued Tuesday. The racketeering corruption trial is expected to last for 10 weeks. If convicted, the six officers face between 40 years and life in prison.